We all know olive oil is good for us, but many people don’t realize how versatile olive oil can be, and just how EASY it is to use. 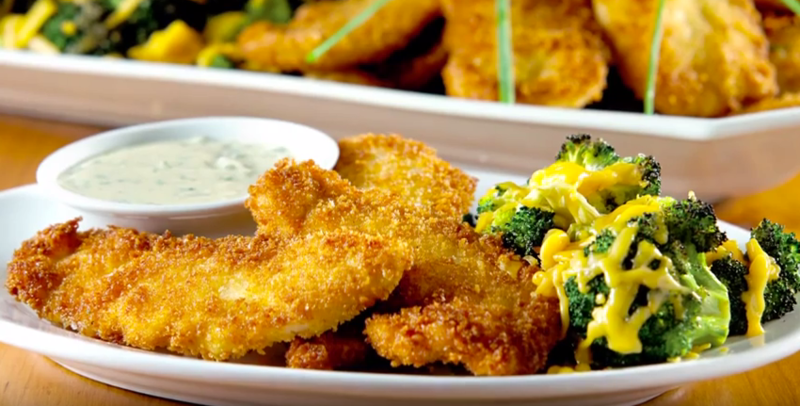 Today, we’re going to use both Extra Virgin Olive Oil and Olive Oil to create a simple dish that appeals to the whole family: Pan-Fried Panko Breaded Chicken Fingers with Roasted “Green Trees” and a healthy twist on Ranch-Style Dressing. It helps to understand that olive oil is actually a blend of refined olive oil with a small amount of virgin olive oil added for flavor. Since it’s mostly refined, the smoke point range is higher and more consistent than the range for Extra Virgin Olive Oil, and it works well for cooking at higher temps, for longer times. A widespread myth is that you can’t cook with olive oil – this is not true! In fact, foods fried in olive oil are less greasy because the olive oil coats the food instead of absorbing into it. As long as you don’t overheat the pan (i.e. hit the smoke point), you can even re-use olive oil from pan-frying once or twice and still get the same appealing texture and quality results. Olive oils are very versatile and can be used for all sorts of cooking methods, from sautéing to roasting to baking. Just remember, if you want to amp up the flavor, use extra virgin olive oil – if not, use olive oil. When cooking or roasting, olive oil locks in food’s natural moisture and enhances the flavor – especially with fresh vegetables! For a real kick of flavor, try some classic cold uses for extra virgin olive oil - like dressings, marinades, and dipping. You can also use extra virgin olive oil to “finish” off your dish – go ahead and drizzle it right on top of meat, fish, vegetables, pasta and even soup!